Nathalie carved out her path on a diverse farm that presented no shortage of challenges. Meet Nathalie Kerbrat, a former executive secretary and real estate agent who learned how to be an entrepreneur "on the job." In 2016, she even landed the Farmer of the Year award from the Fédération des agricultrices du Québec. 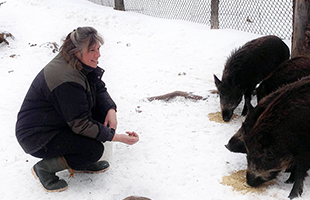 Nathalie raises boar, rabbits and poultry; grows small fruits and vegetables; makes various maple products; mixes her own spice blends; and creates rustic group dinners served on the farm, year round! Nathalie carved out her path on a diverse farm that presented no shortage of challenges. "Mother nature is tough, but fair. She provides incredible energy," says the single mother who celebrates her 55th spring this year. "I'm completely absorbed by it, but I'm also completely satisfied." Nathalie has operated her business, l'Érablière du Sanglier (the boar's maple grove), since 2006. As broad as the name might seem, it really only evokes a slice of what Nathalie creates and produces every day. "The sheer variety and number of things that need doing every day can be overwhelming, but specialization comes at a price if production goes wrong, technically or economically." This year she's interested in hatching and wants to focus more of her attention on what she's learned about permaculture, the development of agricultural ecosystems intended to be complete and self-sustaining. As the only employee at her own company, Nathalie is responsible for anything and everything, "cooking, sourcing, raising and processing--from creation to execution," as she so aptly put it in her application for the Farmer of the Year award. Every year, Nathalie welcomes approximately 2,000 guests to the farm with help from her parents, friends, partner, and daughter, Justine, who studies management and agricultural business technology. "I've chosen a wonderful lifestyle that moves at a bit of an unconventional pace, but I try to take time out to enjoy life, the pool, the hot tub . . . I still 'work' a lot!" A workaholic and self-made woman who was "brought up hard" by European parents who never had it easy, Nathalie experienced a pretty serious burnout two years ago when her work ethic and a habit of never saying "no" eventually caught up to her. "I'd spent several years involved in various social, economic, union and community associations and groups. I realized it was taking a toll on my health and I needed to cut out some of those commitments. Even the work here on the farm, which I'd enjoyed so much, had become a chore." Nathalie Kerbrat had no problem stepping into the role of being her own boss. "It's a question of habit and routine. I'm proud and happy about what I've done and excited about what I'll do next!"